It is recommended to visit the health care professional for removing the stitches. However it is not at all practical all the time in our busy schedule. If there is a situation that that actual healing time has completed and would appears that it is near to closure then one can remove these stitches on their own. For this you will require scissors and tweezers. One must clean the wound and let it dry 24 hours. One must shower after 48 hours and be sure that water does not fall over the wound. The bandages must be removed safely after 48 hours when there is no bleeding. If you find that bandages are wet then, it is advised to replace them with dry bandages. One can use antibiotic ointment. Some of the brands are Neosporin or Polysporin. After the wound is clean use these medicines. Also if the stitch breaks in between then one must immediately call the doctor. Stitches must be removed carefully. To remove stitches first one has to clean the wounds. Using an antiseptic one have to remove encrusted blood and also loosen the scar tissue. There are some sterile forceps like pincers and tongs which are used for picking up knot for each suture and also use surgical scissors or a small knife blade for using to cut the suture. The forceps are used for removing loosened suture and for pulling thread from the skin. These are relatively painless steps. These can be continued until all the stitches are removed. You can feel that there is a tug or slight pull when the stitch is removed. One must clean the wound again. Adhesive strips are placed on the wound. One must allow the wound for continuing it to be strong. When to contact a medical practitioner for removing stitches? To remove stitches one must be really careful. If there is any sign of any infection then one must immediately call a doctor. If the following symptoms are seen then one must take medical help immediately. Discharges coming out of wound. If there is bleeding you can call doctor. 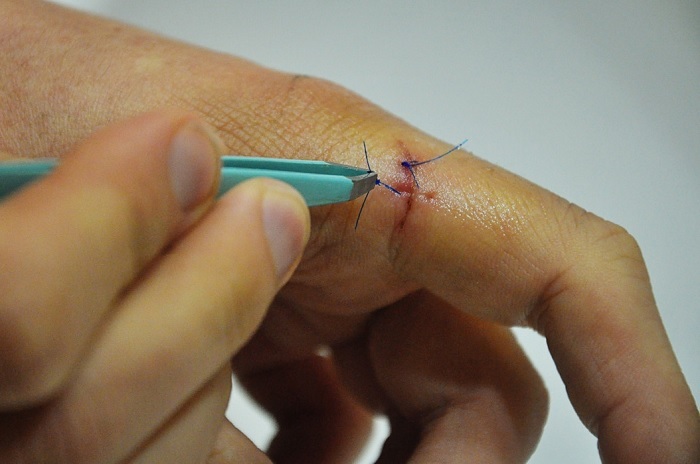 Wound reopening – If stitches are removed before time then on the wound there occurs a force. In such situations wound can reopen. A doctor can restitch it back. Allow the wound to close naturally and less the chances of infection. Wound infection – If there are signs of any infection like redness, swelling or pain then one must call a doctor. For removing stitches one must understand that it is not an easy process. It also depends on the wound type, how to close it and others.